Special Containment Procedures: SCP-708 is to be stored in a warehouse at Sector-19, pending further research. Keys to the ignition lock of SCP-708 are to be kept in a secure lock-box at Site-19 accessible only by Dr. Lentil, with a spare set in a secure lock-box maintained by Dr. Horrigan. Neither set is permitted to be accessed without the consent of at least one (1) Level 4 Personnel. Personnel attempting to make use of SCP-708 or gain access to either of its keys are to be immediately detained and must undergo a psychological evaluation. Keys are to be used in an alternating fashion, so as not to cause excessive wear to them. 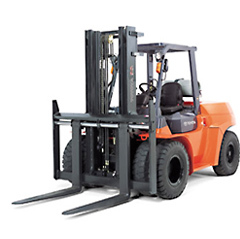 Description: SCP-708 is an orange Toyota Model 7FDU80 7-Series Forklift with a typical lift capacity of 8 metric tonnes. Records indicate it was purchased by [REDACTED] on 7/13/████ and delivered 7/30/████. SCP-708 came to the Foundation's attention when 3 construction workers employed by [REDACTED], while operating the machine, strayed completely from their duties, seeking out objects to lift throughout the city of ███████████, NY. One other construction worker, however, immediately attempted to destroy all members of the crew working at the job site. At this point, the Foundation launched an investigation, and quickly turned to SCP-708 as the culprit, which was proven when Agent ██████ attempted to move the vehicle onto a Foundation transport, and upon starting the vehicle, attempted to lift the transport, instead. Upon maintaining visual contact with SCP-708 for more than 20 seconds, all subjects are rendered into a state of enthusiasm. These subjects will exclaim joyous remarks relating to “riding the big orange forklift,” not unlike a child. This is often accompanied by high-frequency sounds, and hopping up and down as a child in an excited temperament would. Due to the reported annoying effect of these actions, many researchers are compelled to allow the subject to board and operate SCP-708. If a subject is already engaged in operating SCP-708, then those who were previously compelled to operate it, and those who maintain visual contact with the object, report a feeling of jealousy, wishing to remove the current operator. Restraining subjects who express a desire to operate SCP-708 will lead to continued emotional outbursts such as are common amongst young children. At this point it is vital that any subject with a violent history, criminal or otherwise, be restricted from boarding and operating SCP-708, due to the incident on 4/25/████, which resulted in the loss of █ researchers and █ maintenance crew. Upon boarding and starting SCP-708, a range of reactions can be observed. Subjects with a violent past express the urge to eradicate anything immediately obvious to them, making use of the heavy lifting capacity of this vehicle, and will do so at the earliest opportunity. Subjects with no violent past, however, express a desire to lift all objects that they notice. This occurs in order, from lightest to heaviest weight, at the subject's estimation. Subjects with a mildly violent past behave initially as subjects with no record of violence but soon tire of this course and seek to destroy objects at first, and subsequently human beings, lifting heavy objects and using the forklift as a makeshift battering ram. No fuel has been added to the vehicle since the Foundation's acquisition, nor does the vehicle produce any detectable emissions. It has been theorized by Dr. Lentil that SCP-708 may feed on a driver's enthusiasm. This theory is supported by an apparent weariness after the driver has been in contact with the vehicle for more than approximately 1 hour. It has also been recently noted that the vehicle itself does not offer any restraint to the driver besides the driver's own resistance towards leaving the vehicle. Despite the related exhaustion, drivers cannot be removed from SCP-708 without the use of deadly force. All forms of tranquilizer have failed on drivers, presumably due to the amount of adrenaline produced by the driver's body. Attempts to remove the driver by multiple assistants have failed completely, resulting in termination being considered the only option to remove the driver from SCP-708. To date, ██ test subjects have been terminated due to testing.